After a strange game last week at Seaside in which Banks committed four turnovers, had one returned 99 yards for a touchdown and were stopped on the goal line in the final two minutes with an opportunity to win the game and claim the Cowapa League's second seed, things got a little stranger. The Braves defeated Elmira in the play-in round of the OSAA state football playoffs 40-0 Friday night, Oct. 27, but what ended in a one-sided fashion nearly never started due to an oversight that left the players, fans, and this reporter wondering; where's the game? The 7pm game didn't start until nearly 845pm due to a lack of officials, and was initially rescheduled for the following night as a result. But after a little thought and lot of scrambling on the part of the home town administrators, the referees arrived, the players took the field, and Banks advanced to a yet-to-be-determined opening round game. "It was a weird night, but I liked the way the kids responded" said Banks head coach Cole Linehan. "They actually came out more excited and focused than I've ever seen them." The Braves dominated the line on both sides of the ball, accumulating more than 300 yards on the ground, forcing five punts and three Falcon turnovers. Banks wasted little time getting on the board when, after receiver Gunnar Partain converted a fourth down play with a 30-yard catch and run, junior running back Josiah Ochoa ran one in from 20 yards to give the home team a 7-0 lead just 1:08 seconds into the game. Five minutes later, the Braves' Max Merritt notched two more points for Banks when he sacked Elmira quarterback Rowdy Ramirez in the end zone for a safety to make it 9-0, followed just more than a minute after that by a second Ochoa touchdown to give the Braves a 16-0 lead with 3:26 left in the first quarter. And the rout was on. Partain opened the second quarter with a 45 yard touchdown run which ended with the standout receiver tight-roping the left sideline on his way into the end zone. Then junior Blake Markham caught a three-yard fade route from quarterback Hayden Vandehey for Banks' fourth TD of the game, and it was 30-0 as the two teams headed for halftime. "The kids came out and took care of business in that first half," said Linehan. "We didn't throw it much tonight because we didn't have to. We ran the ball really well and it was great to see the running backs get going." It was more of the same in the second-half, as the Braves put together a quick scoring drive compliments of Partain. 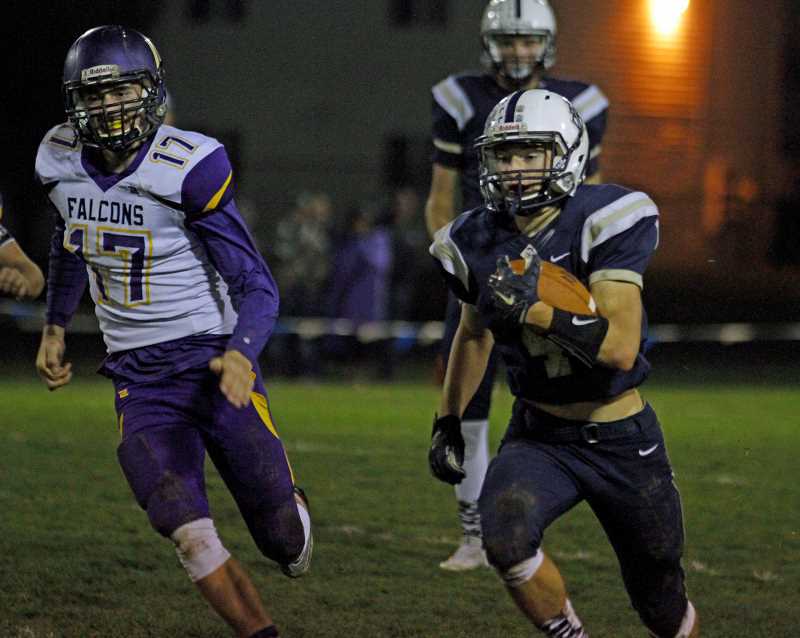 The standout defensive back recovered an Elmira fumble on the third play from scrimmage, then caught a 40-yard touchdown pass from Vandehey on a post route that appeared to go right through the Falcon defender's hands. Banks' Zach Streblow added a 24-yard field goal with 11:10 remaining to cap the scoring, and the Braves closed the game with their reserves giving the starters a well-deserved rest. The win was a nice rebound for Banks after a disappointing end to the regular season a week ago. "It was really unfortunate," said Linehan in regards to the Seaside loss. "We missed a lot of opportunities in that game." Vandehey, who's been outstanding in his first season as the Braves' starting signal-caller, struggled last week as well, throwing three interceptions and losing a fumble. But Linehan noted the quarterback's misfires were in a couple cases more misfortune than mistakes, and remains confident in the junior's ability to perform and rebound from what was a tough defeat. "Hayden gets it," said the coach. "He's been great and he doesn't let those types of games get to him." Linehan will now begin preparing for next week's opponent, but first will spend at least a little time enjoying and appreciating his team's performance against the Falcons, and especially the effort by his defense that, like Vandehey, struggled last week. "I was proud of the defense today," Linehan said. "They got the shutout, they stayed home and showed some good discipline, and did their job. After getting gashed by Seaside last week, I was happy with how they responded."